Bundle and Save – Enjoy LEGOLAND Florida and Fun Spot America Combo! 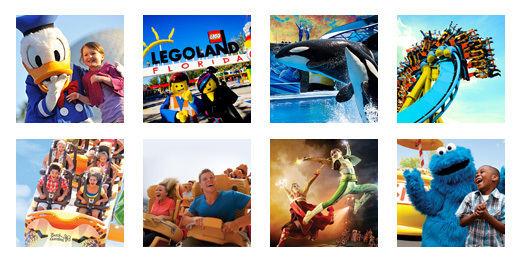 Here’s a triple-play of Florida fun: Check out LEGOLAND Florida Resort, LEGOLAND Water Park and Fun Spot America in a Single Day Combo special from TicketsatWork.com. Enjoy a fun-filled day going back and forth between LEGOLAND and the LEGOLAND Water Park, featuring a sensational line-up of rides, shows and attraction. Then jump over to Fun Spot America, which features go-kart tracks, arcades, coasters, and rides geared for the whole family. If you’re thinking about new travel adventures for the family this year, you can’t go wrong with a trip to the LEGOLAND Florida Resort. The 150-acre interactive theme park offers more than 50 rides, shows and attractions, restaurants, shopping, a botanical garden and the LEGOLAND Water Park all geared to families with children ages 2 to 12. The hot attraction inside LEGOLAND Florida right now is the new LEGO Ninjago World, which opened in January and introduced fans to an immersive area filled with several hands-on, outdoor activities where kids can sharpen their ninja skills before the ultimate showdown on LEGO Ninjago: The Ride. What’s great about Fun Spot America is that it’s Central Florida’s only family-owned theme park. There are two locations to enjoy a day of fun: Orlando and Kissimmee. It’s going to be a super summer at Fun Spot America: In June, the theme park celebrates its 19th birthday (June 10 at the park!). There will be giveaways, music and more. There’s also the June debut of the new wooden roller coaster coming to the Kissimmee location – Mine Blower. For all you thrill-seekers be sure to check out SkyCoaster. If you’ve ever wondered if it’s possible to mix hang gliding and sky diving and bungee jumping all together, well… the SkyCoaster is going to answer your question in a big, exciting way. Arguably one of the most exhilarating rides you’ll ever dare to experience, SkyCoaster takes you to the top of a 180-foot steel arch before taking a flying dive from the top with nothing but sky to catch your fall. If you’re thinking about new travel adventures for the family this year, you can’t go wrong with a triple-dose of fun at LEGOLAND Florida Resort & Water Park, and Fun Spot America. Take advantage of TAW’s Bundle Special and save!